Russian sub-machine gun PPS-41 Shpagin (Part II). Production, service, pictures, 3D model and video. Shooting withg the PPS-41 Shpagin sub-machine gun. 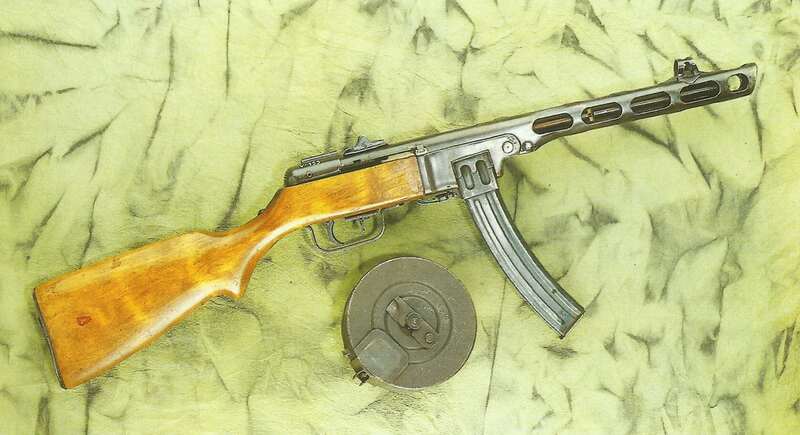 The Russian PPS-41 (or PPSh-41, PPSh-41G) sub-machine gun used stamped steel for the body and jacket, although the barrel was still chromium lined and the weapon still used a wooden stock. Only the barrel and the lock had to be turned and machined, so that even armament factories with limited equipment could produce the PPS-41. An interesting economy was the utilization of old and reserve Mosin-Nagant rifle barrels to provide barrels for the sub-machine gun; one rifle barrel could be cut up to make two sub-­machine gun barrels with a considerable saving in time and machinery. The entire assembly was by pinning and welding, and the barrel jacket extended beyond the muzzle to act as a muzzle brake and compensators to divert some of the gases upwards and thus counteract the tendency, common with all sub-machine guns, for the muzzle to creep upwards during automatic fire. The first models had an optimistic and luxurious tangent sight, but this was soon discarded for a simple peep-sight. The 71-round drum magazine adopted for the PPD was retained, since production of this item was well established and it gave the firer a good reserve of ammunition, no bad thing considering the high rate of fire of this weapon. A PPS-41 manufactured in Iranian Tehran as Model 22 (1943 is the Arabic year 1322) with a loaded box magazine (‘Banana Magazine’) and a drum magazine below. The mechanism was simple blowback, a bolt with fixed firing pin and a return spring being almost the only components apart from an agriculturally simple firing mechanism. It was robust, simple to use, and cheap to make, and something like five million were made during the war. As early as 1942, the Red Army received from several factories about 1.5 million pieces just in this year. During WW2, Tehran’s gun factory established about 10,000 PPS machine guns for the Red Army in occupied Iran. In addition to the 71-round drum a 35-round box magazine was later made for this weapon, but it was much less common than the drum pattern. Large numbers were captured by the German Army on the Eastern Front, so large in fact that they found it worth their while to convert them from 1944-45 to fire 9mm ammunition, altering the magazine housing to take the standard MP40 magazine. If Russian booty munition for unmodified PPS-41 was scarce with the Germans, magazines could also be equipped with the bullets of the 7.63 mm Mauser pistol. In practice, the PPS-41 became a widespread standard weapon for the Wehrmacht as well as for the Red Army and Partisans! Firing with the PPSh at a shooting range. A cartridge is leaving the sub-machine gun. ‘Eastern Front fighter’ with captured PPSh sub-machine gun dressed for a ‘Reenactment operation’. The PPD sub-machine gun is brandished as Russian infantry breaking out from Leningrad. The well-known Russian PPSh 41 sub-machine gun. Russian soldier is aiming with his PPSh. Loading the PPSh with a drum magazine. Russian soldiers, equipped with PPSh and box magazines, are attacking from T34 tanks during the summer offensive of 1944. Hand grenades and PPSh sub-machine guns were the two weapons which best suited the aggressive instincts of the Red Army soldiers. Russian soldiers with PPSh during the fighting in the Ukraine, 1944. Russian partisans armed with PPSh sub-machine guns. Russian infantry with sub-machine guns during the counter-offensives in front of Moscow. 3d model of PPSh 41. Russian marine with PPSh submachine gun at the in 1945 conquered Port Arthur. The PPS-41 sub-machine gun came to be almost the badge of the Red soldier, much as the MP 40 was that of the German. Whole divisions were armed with nothing else, since it was a weapon which well suited the Russian tactics and spirit. With this sort of weapon, you cannot hide in a hole and snipe; the only way to use it effectively is to get out of the hole and go after the enemy, and this they did. Mainly such equipped Russian units were the shock troops, which were riding on the T-34 tanks into battle and were armed only with PPS-41 sub-machine guns and hand grenades. They carried only a minimum amount of ammunition, equipment, and supplies, and only stopped for food or rest. It was not their task to defend and hold the conquered terrain, but only to push forward. Their living conditions were bad, but their life expectancy at the front was much worse. But thousands of these dreaded ‘hordes’ overwhelmed the German Eastern front and pushed everything before them. In such circumstances, the PPS-41 (pronounced by its users as ‘Pah-Pah-Shah’) was practically not well maintained and hardly cleaned. On the Eastern front, it has been spreaded quite fast that it is the best way to keep a weapon fireable even in the dust or at icy temperatures, not to use any kind of oil at all, otherwise it will get stuck or freeze. Video from shooting with the PPS-41.